Need a wrap? Taco shell? Breakfast burrito? Calzone pocket? 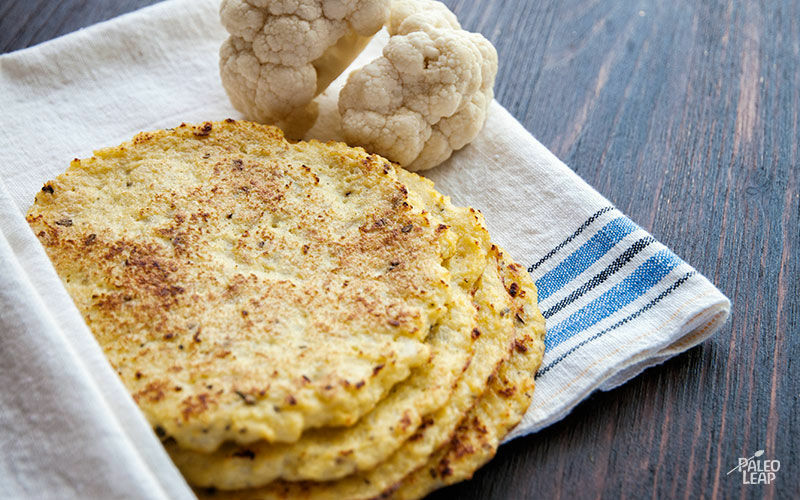 With this quick and versatile cauliflower “tortilla,” you’ve got an all-in-one shell to fill with whatever you like. Give your imagination free range and enjoy experimenting: you can even add some spices to the crust itself to match whatever you’re filling it with. Try chili powder if you like it spicy, or what about cumin to go with an Indian-inspired recipe? Maybe oregano if you’re having Italian? If you’re going for taco shells, the quantities in the recipe will make about 6 tortillas. They come out solid enough to hold a lot of filling, but soft and flexible enough to bend into wraps. If you’re cooking for a family, you might want to double the quantity, because they do come out pretty small and you definitely don’t want to run out! A lot of Paleo bread replacements are made with nut flour, but this recipe is completely flourless and nut-free, so anyone can enjoy it. In fact, unlike most Paleo “treats,” this one would even be healthy to eat every day if you wanted to; the only ingredients are vegetables, eggs, and spices, so there’s really no need to worry about going overboard. Go ahead and wrap up anything your heart desires: you’re getting a big dose of nutrition and a tasty way to make your Paleo meals shine.